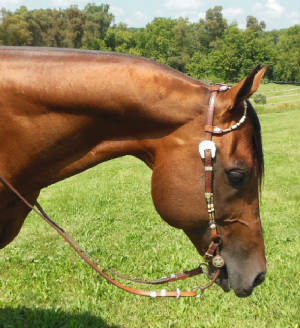 The bloodlines on this horse speak for themselves. 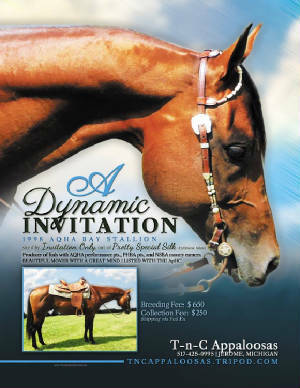 "Invitation Only"
NSBA Hall of Fame Inductee, AQHA Leading Sire2006 - 2011 - #1 Leading Sire of Money Earners. "A Dynamic Invitation" aka: "Beemer" stands 15.1 h.h. with a nice build. 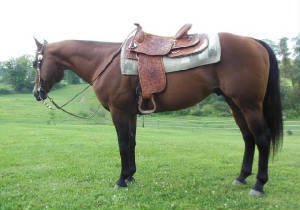 He has produced 22 foals to date; 5 with performance points, 1 with Palomino Performance pts, NSBA money earner, also. Color of foals: 10 Bays, 5 Chestnuts, 3 Sorrels, 2 Buckskins, 1 Palomino, & 1 Brown. Come and see this pretty boy in person. Feel free to visit "A Dynamic Invitaion" on Facebook. Looking forward to the 2015 Breeding Season! 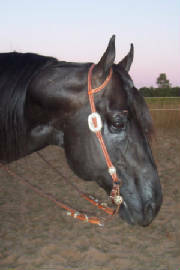 "Magnum" was shown in Open Lungeline Classes as a Yearling, placing very well. He even won a year end circuit award in Lungeline and placed 3rd in the MApHA Breeders NSBA Lungeline. 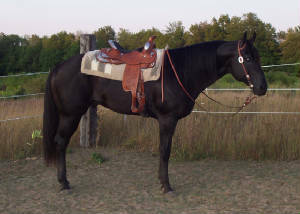 As a 2 yr. old placed well in Walk/Trot classes, with very little time in the saddle. A super color producing stallion. To date all his foals have been 100% "BLACK" based; lots of Black Leopards, even a Grulla and Buckskin (when crossed on Dun factor mares). Tested for the Black Gene = Homozygous Black! 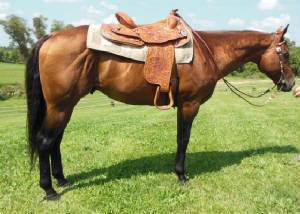 He has a super nice jog and canter, passing it onto his offspring, along with gelding like temperment. 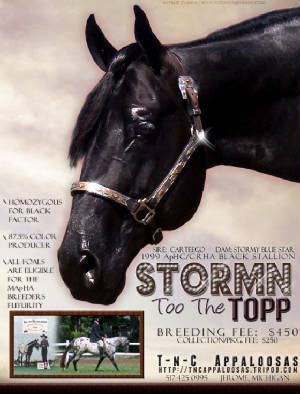 "Stormn Too The Topp" is on FACEBOOK! Shipping Fee: Depends on Location via Fed Ex.